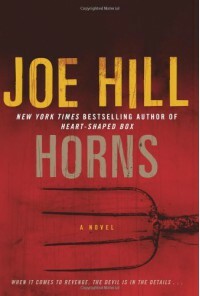 This is my first delve into the world of Joe Hill. I found this book original and I really did not know what was going to happen next. Our main character, Ignatius “Ig” Parrish, has been living a life of hell after his girlfriend was murdered a year ago. Most of the small town blames Ig. Strange things start to happen when these horns began grow from his head and people began spouting every truthful thing they are thinking about Iggy and more. I read this before I saw the movie with Daniel Radcliffe. There is more going on in the book then they fit in the movie. Some metaphysical parts of the story was taken out of the movie possibly because it was hard to understand in the film format but easier picturing mentally. I liked the book because of the questions it brings up about religious beliefs. It brings up ideas about the fight between good and bad, inside all of us or in this case inside Ig Parrish. All the characters really felt unique and really standout. Even after reading the book they still stick with me, making me wondering what the people in Ig’s town is up to now. In the book I was a little confused about the snakes that followed Ig. I think they were able to talk or he was able to understand them somehow. It is something that was cut out of the movie, that and a few minor things. There is a dark and bittersweet feeling over the story from beginning to end. My mind is really attached to the characters, and that is unusual for me. My mind will blank out after I finish if it is not a good book. This one I probably read over six months ago and yet I still remember the fictional people in this book. It is a good October read.